I’ve been sick a lot lately and craving soup. Stuck in bed, when I’ve felt up to it, I’ve also been reading a lot and recently, a soup from Diane Mott Davidson’s book The Main Corpse jumped out and caught my attention. I changed it slightly – left out the mushrooms (I’m allergic), increased some of the quantities, and substituted homemade dumplings (from my grandmother’s recipe that I’ve tweaked a bit) for the noodles. It was outstanding (and I’m not generally much of a soup person). You could certainly add other veggies to it if desired and you could eliminate or decrease the wine. She used only 2 T. and i increased that to add a bit of a coq au vin quality to it. If leaving out the wine entirely, I’d suggest adding in some other acid in its place – perhaps a bit of lemon juice (and then some lemon pepper to round out the flavour) or maybe just a dash of vinegar. Instructions: Melt the butter in a stock pot and add the onion, carrots, and celery. Saute this for a couple minutes to get it started, then add in the pieces of chicken. Put the lid on the pan and cook for about 5 minutes. Turn the chicken, put the lid back on and cook for another 5 minutes. Remove the chicken and put aside to cool just a bit so it’s easier to handle. meanwhile, sprinkle in the flour and stir it into the vegetables and drippings for a couple of minutes to make a bit of a roux. Stir in the wine and half the chicken stock. Cut up the chicken into bite size pieces and put it back in the pot. Add salt and pepper to taste. Add more of the stock as needed to ensure that the chicken and veggies are well covered. I let this simmer for at least an hour but you can leave it longer if that’s more convenient. When ready to add the dumplings, if there’s any remaining stock, I add that to ensure that there is enough space to cook them. The dumplings need to be able to cook without being crowded. To prepare the dumplings, simply mix together all of the ingredients to form a dough. You can roll this out and cut it into pieces to drop into the liquid or drop it from a spoon. The latter will taste a bit “doughier”. I usually do a bit of a “cheat”, grabbing bits and pressing them to flatten a bit with my fingers – sort of a compromise between the two methods. When ready to cook the dumplings (about 20-30 minutes before serving), I first stir in the sour cream and then bring the soup up to a gentle boil. Drop in the dumplings, giving a stir if needed to keep them from sticking together. Cover the pot and cook over a medium simmer/low boil. Resist the urge to take the lid off for at least 20 minutes – the steam that forms inside is what helps to cook the dumplings. After that time, I generally cut into one to check and see that it is cooked all the way through. Once they are, you’re good to go! 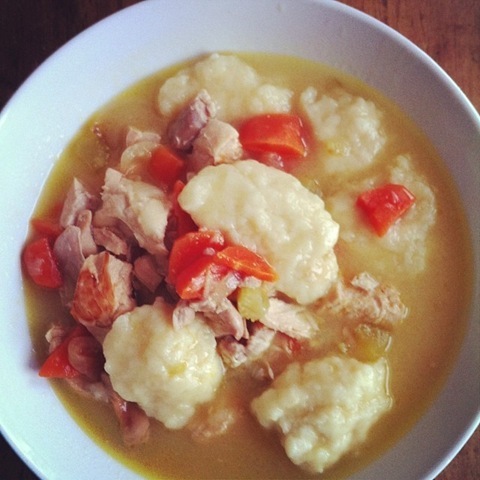 This is great comfort food for when you’re not feeling well and for those cold wintery days! I love soups! About how many servings does this make and do you know if it reheats well? The husband does not like soup so whenever I make it I tend to eat it for lunch for a few days.